Haste! Codename Morningstar, Stealing from Games, Stealth and More! New features! 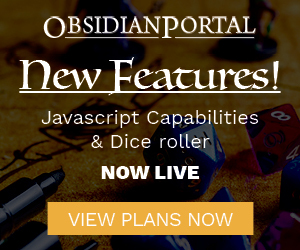 Character & item filters, sortable adventure log dates, bug fixes and more. The next iteration of D&D’s digital presence has emerged at Origins this year, it’s called Codename Morningstar, for now at least. Be sure to check out the progress and what we know so far (via ENWorld). A great bit from Dave over at Critical Hits on stealing from games while making games. Is it bad? We don’t think so, tune in to find out why and give us your thoughts! Everyone does stealth a little differently in their games, this Reddit thread is full of a bunch of good examples. We discuss stealth in general, and we’d love your feedback on how you get it done as well. Check out our new campaign backgrounds, free and paid members should have an array of new ones to choose from! @TALLama asks: I’ve let my campaign’s plot sprawl a little too widely. How to move forward: Ignore uninteresting bits, or reintegrate? I feel that STEALTH usually works better when NARRATIVE trumps MECHANICS. For this reason, I think I would still promote some secret GM rolls, but let’s face it, we often forget to do this, and when the player rolls instead, they still get a kick out of a GOOD ROLL, so as long as STEALTH is not a MAJOR factor in the campaign, I don’t think the mechanics are THAT important. In my games (usually D&D 3.5), players usually deal with stealth management themselves. They know the rules well enough to realize that there’s no way they’re all sneaky enough to get past the guards. So the gnome thief and elf sorceress sneak in using stealth and magic, while the half-orc and the druid wait around the corner. Then they all strike at about the same time from multiple directions and just take the guards out entirely. Yes, it means that the dramatic “without a trace theft of the ambassador’s secret plans” scenes are very rare, but my players tend to be violent heroes anyway; better to knock out the entire staff of the ambassador’s mansion and take the papers than risk one character being caught and imprisoned on a secret mission. I like to run my skill checks in a more narrative, Mouseguardy way. In regards to Stealth, instead of having every character roll individual checks, one character will lead the group in the attempt and the rest of the group can assist with various other skills. For instance, the ranger might use his intuitive perception to pick out a clear path, while the wizard might have used his charm to talk up a few guards ahead of time in order to figure out their patrol times; each success increases the main check by +2, much like Aid Another. This ensures that the fighter – with his heavy armor, shield, and -8 on Stealth – and the wizard – with his complete lack of physical attributes – aren’t automatically dragging down the entire group. I’m also incredibly against secret GM rolls; I feel that it takes away the control of the character from the player. The way I get around horrible rolls is that I ask the player to first describe what they are going to attempt, roll the skill check, and then – depending on the roll – I describe the outcome. This prevents the player from saying things like “I trip and fall on my face” or attempting to alter their check based on the roll.